The Atmospheric Remote-sensing Infrared Exoplanet Large-survey mission (ARIEL) (Tinetti et al. 2017) is one of the three present candidates for the ESA M4 (the fourth medium mission) launch opportunity. The proposed Payload (Eccleston et al. 2017; Morgante et al. 2017; Da Deppo et al. 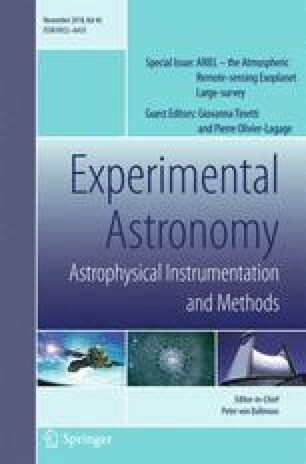 2017) will perform a large unbiased spectroscopic survey from space concerning the nature of exoplanets atmospheres and their interiors to determine the key factors affecting the formation and evolution of planetary systems. ARIEL will observe a large number (> 500) of warm and hot transiting gas giants, Neptunes and super-Earths around a wide range of host star types, targeting planets hotter than 600 K to take advantage of their well-mixed atmospheres. It will exploit primary and secondary transits spectroscopy in the 1.2 − 8μ m spectral range and broad-band photometry in the optical and Near IR (NIR). The main instrument of the ARIEL Payload is the IR Spectrometer (AIRS) (Amiaux et al. 2017) providing low-resolution spectroscopy in two IR channels: C h a n n e l 0 (C H 0) for the 1.95 − 3.90μ m band and C h a n n e l 1 (C H 1) for the 3.90 − 7.80μ m range. It is located at the intermediate focal plane of the telescope (Da Deppo et al. 2016, 2017, 2017) and common optical system and it hosts two IR sensors and two cold front-end electronics (CFEE) for detectors readout, a well defined process calibrated for the selected target brightness and driven by the Payload’s Instrument Control Unit (ICU). The authors gratefully acknowledge the UKSA/SFTC, the European Research Council (ERC) for the founded project ExoLights (617119), the Italian Space Agency for the financial contribution to the ARIEL project in the framework of the ASI-INAF agreement 2015-038-R.0 and the Spanish Ministry of Economy and Competitiveness (MINECO) for the support through grants ESP2014-57495C2-2-R and ESP2016-80435-C2-1-R. Many thanks also to CGS/OHB Italy for the help to the DCU board design. Finally, a special thank to the European Space Agency for the support provided by the ARIEL Study Team.